The post Tyler, the Creator and A$ AP Rocky – Golf Media Freestyle [New Music] appeared first on Urban Islandz. The post Tyler, the Creator and A$ AP Rocky – Golf Media Freestyle Lyrics appeared first on Urban Islandz. 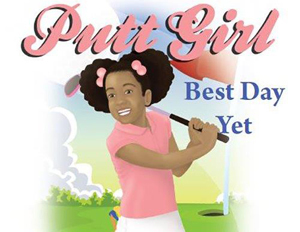 Author Deborah Cousar-Saunders’s Putt Girl book series is, on the surface, about a little brown-skinned girl who loves golf. But there are a lot of positive messages packed into the series’ first book, Best Day Yet (the next book is coming out in early June). Much of it is inspired by Cousar-Saunders’s own life. The book reflects the close bond Cousar-Saunders enjoyed with her own dad when she was a child. An avid golfer, he took his son and daughter out on the golf course and incited in them a love for the game. Cousar-Saunders started playing golf when she was 8, and would go on to play in the Junior PGA. At her school there was no girls team—so she played on the boys team and was its No. 1 player from 10th to 12th grade. She was eventually awarded a four-year golf scholarship to college. Because of her rich experience with the game, Cousar-Saunders wrote the series to spread the word to African American girls, whom she rarely competed against growing up, that golf is a rewarding game that teaches many lessons. Best Day Yet tells the story of young girl named Paige who wants to spend Saturday with her mother. Her mother isn’t feeling well, so Paige has to spend the day on the golf course with her father and slightly older brother. Despite Paige’s initial disappointment, the day turns out to be her best day yet. She meets a golf instructor and learns the basics of the game. Her passion for golf is ignited. “The book promotes strong family connection, reading, and learning,” says Cousar-Saunders, who depicts the main character as a girl who reads the dictionary to discover big words. And it is a refreshingly multicultural children’s book. Paige doesn’t live or go to school in racial isolation. Her friends and teachers reflect the rainbow of American diversity. If you’re looking for a book for World Book Day—a book that encourages youngsters to try new things and to value learning, the Putt Girl series Best Day Yet is worth a look. For more information about Deborah Cousar-Saunders and the Putt Girl series, go to PuttGirl.com, or visit the Putt Girl Facebook page.